It been in a display case in my radio collection display room ever since. Just a couple of weeks ago the Mecklenburg Amateur Radio Society had their annual hamfest. They advertised it as their 60th anniversary. I happened to think about the ribbon. 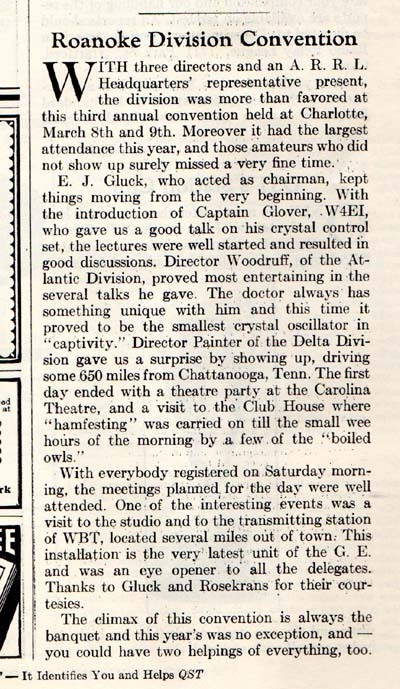 This makes it the 82nd anniversary of the Roanoke Division convention since the ribbon says 1929 was the third annual I would guess the first one was in 1927. 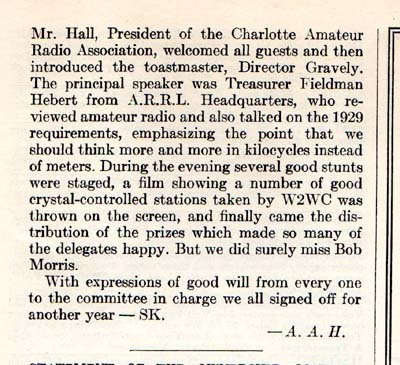 May 1929 issue of QST. In the 20s ZZ suffix calls were issued to mobile stations. This was a time when they issued a license for fixed stations and another one for mobile stations. ROLAND O AKRE, W3EJ-1929 MIAMI FL SK Mem#1338. He was born in 1904, and licensed as W4ZZZ in 1929. He passed away in 1987. Trustee was KL7LG Roland Akre. Roland Akre was a Colonel in the US Air Force. His son Roland C. Akre now holds the call K4ZZ. for his help with this research.